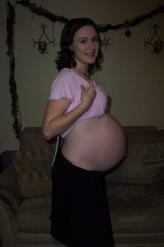 Here’s a picture of my stomach when I found out I was pregnant…I was about 8 weeks along. 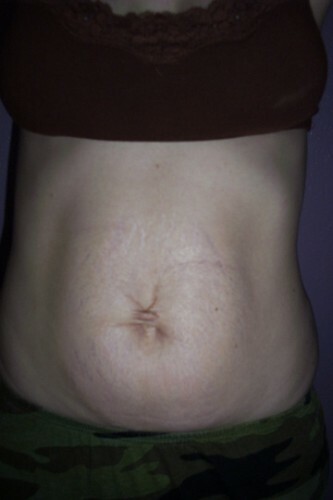 And finally, here is the picture of what my stomach looks like now. They are 8 months old now, so this looks a lot better than it did a couple of months ago. I wanted to thank you for making this website. It’s so nice to know that I am normal, and that not everyone looks like a supermodel! Yes, my body doesn’t look the same way it did before they were born, but they were so worth it…I like to think of my “twinskin” as a badge of honor. If you don’t mind my saying, you were a positively RADIANT pregnant woman! And twins! Congrats!I love your postpartum photo! And to be honest, your stomach looks better than mine did 1 year postpartum with a single pregnancy! !